Curious about the AHOY title CAPTAIN GINGER, created by me and artist June Brigman? You don’t have to wait. We actually published a three-page GINGER story earlier this year, in the anthology Mine! It’s available right now. Mine! is a giant-sized, diverse anthology with dozens of creators in it, ranging from Neil Gaiman to Mark Waid to Gail Simone and our own Rachel Pollack and Tom Peyer, to name just a few. It’s published by ComicMix, one of the finest review/commentary sites in the field. And best of all: It’s a benefit for Planned Parenthood. AHOY: Give us the details on Mine! What is it, where’s it available, how can people get hold of it? Molly Jackson: Mine! is a celebration of the amazing work of Planned Parenthood and personal empowerment. It includes stories about healthcare, personal experiences and empowerment. The types of story genres range from historical, dramas, science fiction, fantasy, superhero, and satirical stories. 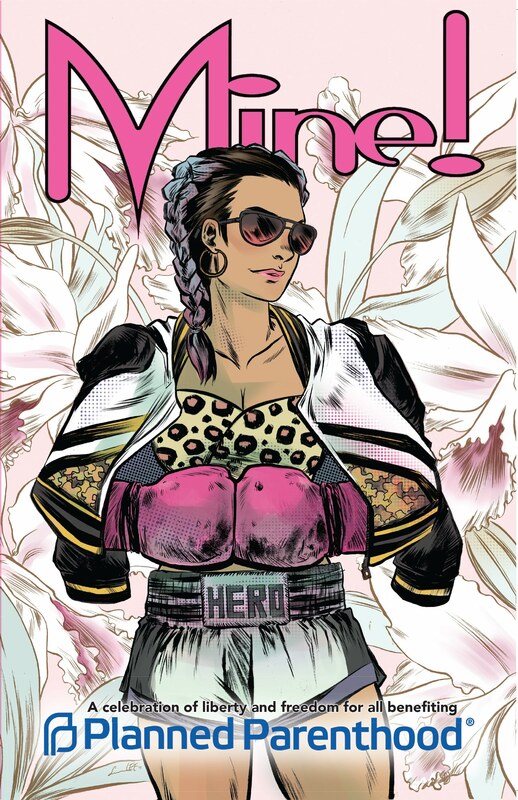 Joe Corallo: All the proceeds go to benefit Planned Parenthood. It’s over 300 pages with over 150 creators telling a wide range of stories. It’s available through Diamond, so you your local comic shop might have it, or you can ask them to order it. Additionally, it’s available through Barnes & Noble, Amazon, ComiXology, and through our website at www.comicmix.com/mine . Molly: I am the co-founder of [insertgeekhere], columnist and reporter for ComicMix, and a project editor for Mine! In the rare moments that I have spare time, I spend it hiding in Brooklyn, watching old episodes of Star Trek. Joe: Thanks for asking! I’ve been into comics since the 3rd grade when I got a copy of Sonic The Hedgehog #28 at KMart while I was with my mom doing errands. I ended up getting a subscription, going back and collecting the back issues, picking up copies at the convenience store in town when they’d get new comics on their spinner rack. In high school I had a friend working at a local comic shop and got into Ultimate Spider-Man, Runaways, and eventually Astonishing X-Men in college. After I graduated I worked on political and advocacy campaigns around the country and fell off reading monthlies, but was picking up trades which is when I got into The Walking Dead. Once I was living back in New York and The New 52 launched, I got back into monthly comics and I’ve been keeping up to various degrees ever since. That’s around when I started to get into writing comics and self publishing. Not too long after that I met Molly at Midtown Comics Downtown where we became quick friends and I started writing for her site [insertgeekhere], mostly doing comic reviews. We both ended up writing columns at ComicMix a couple of years or so after that. Additionally, I contribute to Geeks OUT, Geek.com, CBR, in addition to having short comics I’ve written in anthologies like This NIghtmare Kills Fascists and editing comics including Black Mask Studios’ first ongoing series, OH S#!T IT’S KIM & KIM. Joe: Back in December of 2015, Molly and I grabbed pizza over in Astoria, Queens. While we were there we talked about how we wanted to do an anthology. We started throwing around some ideas like maybe doing a Golden Age throwback, a crime anthology, etc. By early 2016 we settled on doing a benefit anthology and I floated the idea of Planned Parenthood as I had a contact there. Everyone involved at ComicMix at the time were for it, so I reached out, and we got kicked up the ladder until we finally got to who we needed. It was a lot of conference calls, but we did it! Molly: After a few ideas were tossed back and forth, we came upon the idea of PP. We both support their work and even before the 2016 election, PP was being attacked relentlessly. Any funny (or scary) stories about putting it together? Joe: When we were pairing people up, I thought that Louise Simonson and Tommy Lee Edwards would make a great team up, and it turned out they were both fans of each other and loved the idea. The story is gorgeous too, but John Workman’s lettering is part of that too. John also did the logo for the book. That really is a great part of editorial work—when you can match up a writer and artist who haven’t worked together before, and everything clicks. Molly: The scary story was how crazy everything got after that 2016 election. Joe and I both thought everything was going Clinton’s way, and when it didn’t, it threw both us and the staff at PP. That slowed the book’s progress tremendously, but luckily it all worked out. Joe: After the 2016 election, things came to a halt as Planned Parenthood really needed to focus on their survival, which is understandable. We were able to shift from a commercial co-venture to a logo agreement which required less work on their end and made the project possible. Is there any particular writer or artist you wanted to get for MINE!, but couldn’t? Molly: We had several people we asked who just didn’t have room in their schedule. I was really bummed we didn’t get Vivek Tiwary. He was all ready to write something but with his new show with Alanis Morrisette starting, the timing didn’t work out. That said, I am so happy with the roster of creators involved and can’t imagine this book without each one. Joe: Not exactly. I mean, there were people that we had lined up that it ended up not working out for no fault of their own, and that was sad, like Gerard Way, Jamal Igle and Vito Delsante. We were very fortunate to get everyone we did get in the book though as we had some of the best in the business, like Tom Peyer, June Brigman, and Stuart Moore! You’re both occasional columnists for ComicMix. As one would expect, your essays tend to focus on issues of social justice. Do you have a particular beat or subject area that you try to cover? What do you hope to communicate and/or promote through your columns? Molly: I tend to promote women’s issues and occasionally religious tolerance. I think that the comics industry has proven time after time that it forgets women are comics fans too. And with groups like D&C causing “comicsgate,” it can’t hurt to remind them we aren’t going anywhere. It boggles my mind how much energy people put into hating others. It seems like such a waste. Joe: At any of the outlets that will allow me to scream into the abyss, I try to promote diversity. I like to highlight Kickstarter campaigns from women, queer creators, and/or POC creators. I try to review comics from smaller publishers that are looking to do something a bit different. And I try to highlight creators who don’t get the recognition they deserve like Rachel Pollack and Mindy Newell. What are you reading these days? Comics, books, magazines, websites? Joe: Trying to stay on top of comics alone is hard enough without throwing other media into the mix! I’ve been reading a lot of what Black Mask Studios puts out including The Wilds, Breathless, Come Into Me and We Are The Danger. Over at Vault Comics I’ve been checking out Vagrant Queen, Deep Roots, Alien Bounty Hunter, Maxwell’s Demons, Songs for the Dead, Reactor, Wasted Space, and Cult Classic: Return to Whisper. I’m pretty caught up on Shadowman over at Valiant. Shade, the Changing Woman and Eternity Girl are two of my favorites coming out through DC’s Young Animal imprint. Supersons is probably my favorite superhero comic at the big two right now and I’m thrilled it’s not actually cancelled. And I read some Marvel too, I swear! Molly: I’ve taken a quick break from comics to read through Brandon Sanderson’s body of work. The different series’ that make up his shared universe the Cosmere are amazing works of fantasy. However, I’m overly excited for the new titles coming from Valiant. They answered my prayers for a Livewire series! I’m also excited for Jook Joint from Image. And while it’s weird, I’m intrigued for the Star Trek/Transformers crossover from IDW. So I have plenty to keep me busy while I wait for my copy of Captain Ginger. You guys are really good at this cross-promotion stuff. Hats off. Okay, let’s get to it. Michael Cohen: snitch or soldier? Flipper or Trump-For-Life? What’s the over/under? Joe: I think he’s a snitch and a flipper (not to be confused with the beloved TV dolphin of my youth), or at least he’s going to be if he’s not yet. I wouldn’t necessarily be surprised if he didn’t flip, but I’d assume he didn’t because of great risk to his well-being. Molly: All I care about is how long he spends in jail. I hope it’s a loooooooooooooong time. What’s your view of the comics industry today? Do you see it opening up to different demographics, different viewpoints? Or is it still too much of an old boys’ club? Molly: The industry seems to be at a pivotal point right now. It feels like there are big changes happening and groups of people, both fans and professionals, are actively fighting those potential changes. As a woman, it feels like the old boys’ club is starting to feel not quite as powerful. I’m grateful for all the industry pros that have welcomed me. Still, I recognize that this boys club still exists every time I hear about another comic vet accused of sexual harassment and assault. Ultimately, the comics industry will survive this because it can change and grow as new voices join to help shape the future. Joe: I think the comics industry is very open as long as we’re talking about it as a whole. The big two, like most large companies, take time to move and adapt with the market, and there is a fear that any big changes can alienate the audience you have. I think DC in particular is making some great moves by introducing imprints like DC Ink and DC Zoom. With webcomics and crowdfunding platforms, comics have become more accessible than ever. I think lots of different demographics and viewpoints are represented now, particularly through those two platforms. People like C. Spike Trotman and Pat Shand have their own publishing arms made possible through Kickstarter, which has been taking comics more seriously by hiring former DC editor Camilla Zhang to be their comics outreach lead. We’re seeing more and more of these projects, like Check, Please! which is a popular webcomic that just made over $350,000 on Kickstarter in 30 days. That’s to create a printed edition of its third volume, to be published in the fall by First Second despite the fact that it’s available online already. The market is there, the demand is there, and coupled with social media, it’s becoming easier and easier for people to vent their frustrations about how slow the bigger, traditional comics companies have been to tap into these markets. We’re also seeing a conservative backlash. We’ve seen people like Vox Day tapping into the crowdfunding formula to raise over $235,000 on his comics projects by tapping into the conservative market, and by using Confederate imagery at the height of the Confederate statues debate last year. What I think will ultimately happen in terms of this backlash is that some of the all-stars behind that movement will continue to crowdfund projects successfully, others within that community will also crowdfund projects with mixed success, and things will adjust to the size of their fanbase. There is plenty of room for different viewpoints in comics, because comics is not nearly as restrained as it used to be. And ultimately comics as a medium survives because of the readership, not the publishers or the pros. It’s up to them to create content that resonates with people. And if they don’t, others will step in and make it happen, because comics is bigger than just a handful of traditional floppy publishers. What else is going on in your life? Any shout-outs you want to make? Rants you need to get off your chest? Joe: As I mentioned earlier I’m editing the ongoing Kim and Kim series over at Black Mask Studios, so please check it out! It’s a monthly hitting shelves in July. I have a short story in the prose anthology They Keep Killing Glenn edited by Peter David and Kathleen David, available now on Amazon and Barnes & Noble. I also have a story in the upcoming Everything Is Going Wrong anthology with Liana Kangas that’ll be available this fall. And check out my weekly column at Geek.com where I write up about five comics Kickstarters you should back that goes up every Sunday. Who’s running things, anyway? Can you tell me? I’d really like to know. Joe: The queer conspiracy. This will come as quite the surprise to the lizard people living under the earth, but you didn’t hear this from me. Molly: At this point, I’m guessing a seven year old with fruit punch mouth on an unending sugar high. 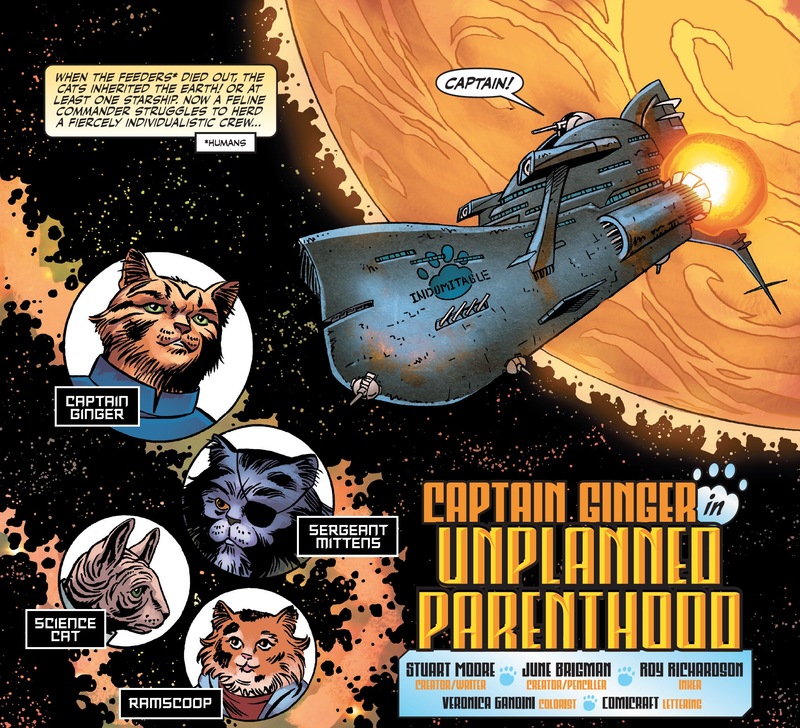 CAPTAIN GINGER #1 - coming October 2018!